Situated on a hillside location enjoying panoramic sea views, the site also offering seclusion. Driveway leading to Cliff Road with easy access on foot to the historic Royal Military Canal, the seafront, and Cinque port town of Hythe, which offers the all important Waitrose Store together with Sainsbury's and Aldi. The town centre offers a good selection of independent shops, pubs and restaurants. A few miles from Hythe is the pretty village of Sandgate offering a mix of antique shops, curio shops, cafes, pubs and restaurants as well as an unspoilt promenade leading to the coastal park and children's adventure park, the promenade continuing to the Harbour Arm in Folkestone which has been subject to substantial investment in recent years and now offers a good selection of pop up restaurants and bars, together with the champagne bar in the old lighthouse. The newly refurbished railway bridge across the harbour links to the award winning Rock Salt restaurant and the sandy beaches. The M20 Motorway, Channel Tunnel Terminal and Port of Dover are also easily accessed by car. High-speed rail services are available from both Folkestone stations giving access to London St Pancras in just over fifty minutes. The area is also well serviced for primary and secondary schooling including both boys' and girls' grammar schools in Folkestone. A south facing detached residence having been subject to total refurbishment in more recent years by the present owners and now offering a quite unique residence having extensive open plan living area with bi fold doors leading to a sun terrace and panoramic sea views. While being open plan there are still areas to cosy down in to. There is a ground floor guest bedroom adjacent to the bathroom and upstairs a master suite complete with bedroom having a feature contemporary log burner, panoramic views and en suite shower room; a further double bedroom on this floor enjoys panoramic sea views. Outside the south facing garden has been carefully planned with an attention to planting of palms, flowers, shrubs and trees all made as low maintenance as possible having extensive Astro turf lawns, this area also having a heated swimming pool and outside shower. Beneath the property is a spa enjoying double showers, seating area and steam room with a feature LED arched roof area with multi coloured lighting. This truly beautiful home needs to be viewed to be appreciated. Dining area with further Upvc double glazed bay windows with panoramic sea views, further double glazed side window, radiator, coved ceiling, storage cupboard, security entry phone. OUTSIDE The gardens are considered to be a major feature of the property, there being an extensive composite wood decked terrace with glass balustrade having fabulous views over the garden and swimming pool and panoramic views over the sea. 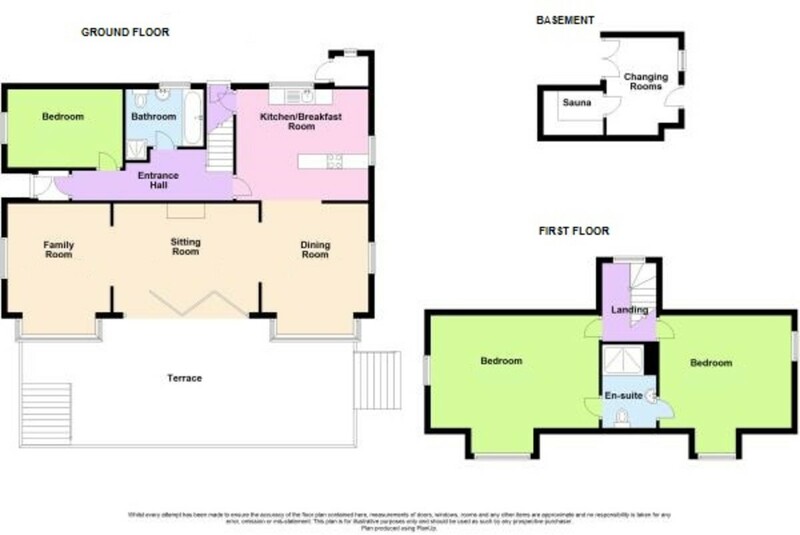 Outside power point, outside lights and steps to side garden with feature flowering cherry tree and herb beds and soft fruit bushes, brick block pathway and steps to rear gardens. SPA (located under property) having mosaic tiling to floor and two showers, heated towel rail, inset spotlights, built in seat units and Upvc double glazed window with shutters, built in storage cupboards, glazed door to steam room being full mosaic tiled with feature curved ceiling with inset LED lighting with changing colours, attractive rear garden area having brick block paving with inset flower and shrub beds, established trees and shrubs giving much seclusion, outside tap, boiler cupboard housing Worcester combination gas fired boiler for central heating and domestic hot water. Timber garage with double doors and security lighting outside. Large south facing garden area laid to quality Astro turf for ease of maintenance and having feature heated pool with cover, feature raised shrub bed with palms and exotic planting. Outside shower, brick paved patio area, timber shed for storage and filtration and heat unit for pool, the whole garden being beautifully secluded by hedging and trees. Two timber storage units, gateway to driveway.